The so called 'Stolpersteine', or stumbling stones by German artist Gunter Demnig of Holocaust victims Henriette Fischer and Helene Asriel set into Genthiener Strasse street in Berlin, Germany. Demnig has set more than 25,000 of these stumbling stones which are shiny brass plaques in the size of a child's hand and which mark the lives of people lost to the Nazis between 1933 and 1945, fixed in front of places were they once lived before they were killed in the Holocaust. One of the stones reads "Davisco Asriel lived here. Born in 1882. Deported 25.1.1942. Murdered in Riga." Artist Demnig said "It's a social sculpture and if you look at it as a whole, it is the biggest art monument in the world." AP Photo/Markus Schreiber. BERLIN (AP).- Artist Gunter Demnig carefully pried a cobblestone out of the sidewalk on Friedrichstrasse in downtown Berlin and replaced it with a shiny square brass plaque. "Davisco Asriel lived here," the inscription read. "Born in 1882. Deported 25.1.1942. Murdered in Riga." It was the latest of more than 25,000 such plaques that Demnig has installed across Europe in front of the homes of people later killed in the Holocaust. He calls his works "Stolpersteine," or stumbling stones, and says that with his art he wants to bring back the names of the millions of Jews, gays, resistance fighters and Gypsies who perished at the hands of the Nazis between 1933 and 1945. "The victims get back a piece of their identity and at the same time, every personal stone is also meant as a symbol for the entirety of all victims," said the 62-year-old artist, his trademark straw hat pulled down low over as he looked at the new plaque. "It's a social sculpture and if you look at it as a whole, it is the biggest art monument in the world." Over the past few years, several Holocaust memorials have been erected in Berlin  most famously the Memorial to the Murdered Jews of Europe next to the Brandenburg Gate, with its 2,700 undulating gray slabs that eerily resemble a huge cemetery. But while all of these monuments commemorate the victims as a somewhat anonymous group, Demnig has brought back the names of Jews and others to the places where they once lived, in 569 communities and cities across Germany and also in Poland, Hungary, the Czech Republic, Italy and Austria. In Berlin, where roughly 55,000 people were rounded up and killed in the Holocaust, there are some 2,800 brass tiles marking the dead all over town. Tourists or locals can often be seen stopping and leaning over the golden palm-sized plaques to read the inscriptions. The plaques are called stumbling stones because one unexpectedly trips over them  figuratively speaking, that is  while strolling through the city. During the recent stone setting for Davisco Asriel on Friedrichstrasse, family members came from Chicago and Haifa in Israel. They stood in a circle around Demnig as he poured concrete into the hole, set the plaque, then swept the last grains of sand off the shiny surface. Dozens of passers-by stopped to listen as 85-year-old Jochanan Asriel talked about his father Davisco, a fur trader and former head of the Jewish-Turkish community of Berlin. Asriel, who now lives in Haifa, remembered that his father once lived in an elegant villa on the spot on Friedrichstrasse marked with the new stumbling stone, where today exclusive malls and chain stores line the street. "I have very mixed feelings today," Asriel said. "But the main thing is to leave some heritage for my children and grandchildren, that they know where they come from." 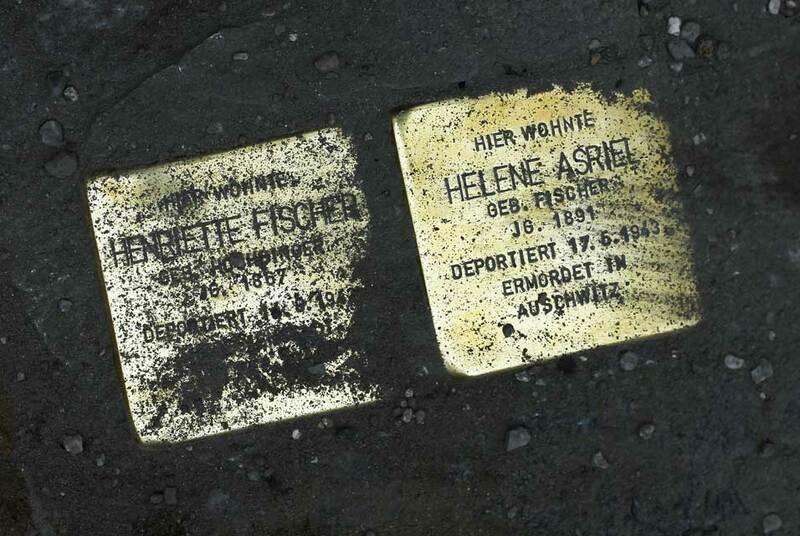 Demnig also set two plaques for Jochanan's mother Helene Asriel and grandmother Henriette Fischer, who were deported to Theresienstadt and Auschwitz respectively and killed. Jochanan Asriel was still a teenager when the Nazis deported his father to Riga, Latvia, where many Jews were murdered  and he barely managed to escape the gas chambers himself. He fled to Denmark in 1939 where he helped out on a farm until the Nazis occupied the country in 1940 and he had to run away again. After an odyssey that took him from Denmark to Sweden, Finland, Russia, Ukraine, Turkey, Lebanon and Palestine, he settled down in Haifa and never returned to his native Germany until the day of the plaque setting last week. Demnig set his first stumbling stone illegally in Berlin in 1996, as part of an independent art project. After several years of negotiations, the city of Berlin allowed him to add more legally and other cities soon followed. Since then, his art project has turned into something of a social movement. Anybody can get in touch with the artist and sponsor a stumbling stone for euro95 ($120) which pays for the artist's work and material used for the plaque. The historical research is done voluntarily by local citizens, school classes or surviving family members, who then contact Demnig and ask him to set a plaque for a victim whose address their have tracked down. In Berlin, there are three full-time paid city workers who support the volunteers and who also serve as contacts for surviving family members who want to attend a plaque setting. Often these settings even turn into ceremonies for the dead, Demnig said, like in the case of the one for Davisco Asriel. The artist said such events are one of the most important aspects of his art project because they bring together relatives who were torn apart by the Holocaust. "I don't see my stones as tombstones," Demnig said. "But since most Holocaust victims don't have graves, the stumbling stones are often the first actual place for family members or friends of the victims to pray or put down flowers."